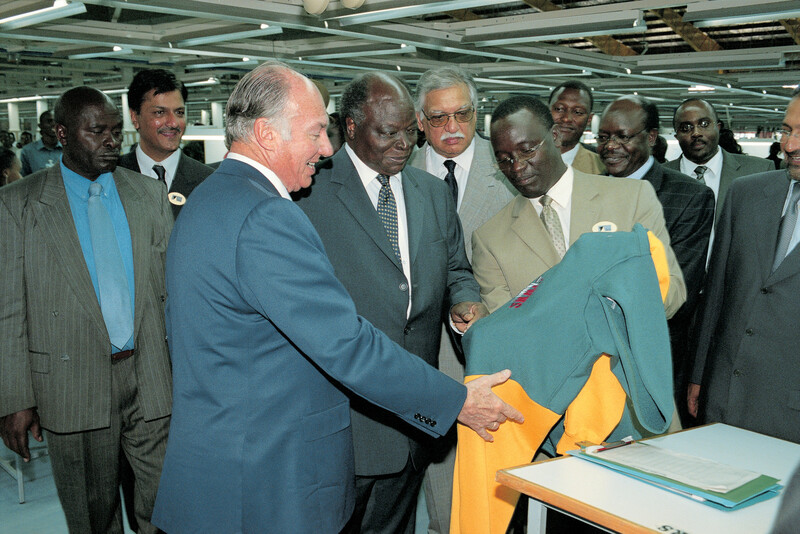 His Highness the Aga Khan and His Excellency President Mwai Kibaki touring the Alltex factory, Athi River, Kenya. Athi River, Kenya, 19 December 2003 - Kenya's President Mwai Kibaki today officially opened the US$7.2 million Alltex EPZ Limited plant in the Export Processing Zone at Athi River in the presence of His Highness the Aga Khan, Imam (spiritual leader) of the Shia Ismaili Muslims and Chairman of the Aga Khan Fund for Economic Development (AKFED). Alltex is a state-of-the-art facility that has created employment for over 2,000 Kenyans, over 80% of them women. The plant, one of the largest textile factories in the zone and the only one that is purpose-built, has set benchmarks in technology, training and productivity. Its pioneering welfare and childcare facilities rank it as a regional industry leader. Alltex is a 100% export-oriented apparel manufacturing unit created to benefit from access to the US$ 100 billion United States market for apparel made possible by U.S. legislation under the African Growth and Opportunities Act (AGOA). The company is a joint venture between Industrial Promotion Services (Kenya) Limited (IPS) and Global Readymade Garments Industry LLC of Qatar. Taking the occasion to outline the approach taken by the Aga Khan Development Network (AKDN) to economic development, the Aga Khan said "investment decisions are based more on the prospects for better lives for the constituencies of people that will be impacted by the investments and their results rather than on bottom-line profitability." He went on to situate this approach within the wider context of the historical role of the Ismaili Imamat for whom "the meaning of 'quality of life' extends to the entire ethical and social context in which people live, and not only to their material well-being measured over generation after generation." "My government welcomes this investment," said President Kibaki, recognising the achievement represented by Alltex as well as the long-standing commitment of the Aga Khan and his institutions to the development of Kenya. He said that a recent US$32 million equity injection by IPS's shareholders "has provided a clear signal to investors that there is now a hospitable equivalent for investment in Kenya." "It is also," the President continued, "in line with our aspiration of adding value to a wide range of products in the economy." He cited as an example of the same approach, the way in which the cotton industry had been a major catalyst for the Asian tiger economies. Elaborating on the Imamat's holistic vision of development, as prescribed by the faith of Islam, the Aga Khan said that it was about "investing in people, in their pluralism, in their intellectual pursuit, and search for new and useful knowledge, just as much as in material resources." "But," he continued, "it is also about investing with a social conscience inspired by the ethics of Islam." Distinguishing AKFED as a for-profit development agency investing "on criteria far different from those of a straightforward commercial investor," the Aga Khan highlighted the fact that these investments occurred in sectors of national and regional priority, "creating new human and material resources for the future...adapting new technologies...and developing new national and international markets." "For us," he said, "responding appropriately to economic opportunity means finding ways of positively impacting people's lives." The Aga Khan made reference to pioneering social services such as the crèche at Alltex and programmes for HIV/AIDS sufferers. President Kibaki also shared his conviction that Kenya had the potential to be a key supplier of textile goods in the international textile market." He appealed for "industrial harmony" saying "we shall a create climate which ensures that factory owners get a fair return for their investment,"he said. "They, in return, should respect the rights of workers to a fair wage and conditions of work." Kenya's Industry Minister Mukisa Kituyi expressed the government's strong support for Alltex's plans for backward integration and spoke of encouraging signs that the U.S. Congress might extend the period during which the advantages of AGOA can be enjoyed. He also warned that in January 2005, the AGOA quota advantage would end leaving manufacturers with only an export duty advantage. Regionalisation, the Aga Khan noted, was one of the ways in which countries of the developing world could become more effective in the use of limited resources. He observed that the planned East African customs union could whilst it widened markets and growth potential, "help refine and strengthen efficiencies in this country." The AKDN, he emphasised, remains committed to the regional approach. The Aga Khan urged, however, that the East African countries "widen the horizons of their regionalisation endeavours to include all the key development institutions and resources of civil society." "It is when that happens, and only when that happens," he said, " that the totality of the region's human resources will be fully and optimally mobilised, including the capacities of the NGOs, voluntary agencies and liberal professions." The Aga Khan explained that the Imamat's approach "has often meant taking courageous but calculated steps to create opportunity in environments that are fragile and complex." "Rehabilitating economies arising out of civil conflict or internal turmoil has been a challenge we have undertaken in environments as varied as Afghanistan, Bangladesh, Mozambique, Tajikistan and Uganda," he said, citing projects in telecommunications, tourism, power generation and microfinance in those countries. Conscious of global concerns about the working environments and conditions in the textile industry in various parts of the developing world, Alltex has created one of the most up-to-date apparel manufacturing facilities in Kenya. Its social amenities amongst the best available in any industry in the country. Alltex has been particularly commended for its crèche which is arguably the only one of its kind in the East African region. Alltex, which has doubled its initial capacity within six months will, during 2004, require fabric equivalent to Kenya's entire cotton production for 2003. The company has plans for backward integration into fabric manufacturing and sixteen hectares have been earmarked for expansion needs. IPS is an affiliate of the Aga Khan Fund for Economic Development (AKFED) which promotes private sector initiatives and entrepreneurship through equity investment particularly in Africa and Asia. AKFED is the economic development arm of the Aga Khan Development Network, which is a group of private, international, non-denominational development agencies working to improve living conditions and opportunities for people in specific regions of the developing world. IPS has been providing venture capital, technical assistance and management support with the objective of encouraging and expanding private enterprise in Eastern Africa since the early 1960s.